Cold Start: So many product and feature announcements! This week's Cold Start, product announcements and events from us, IOpipe, PureSec, Thundra, and of course AWS. This past week we saw announcements and unveils by several companies in the AWS serverless space. Along with announcements by AWS at their Summit event last week, there was news from IOpipe, Thundra, PureSec, and of course us! Last week we did our first training! 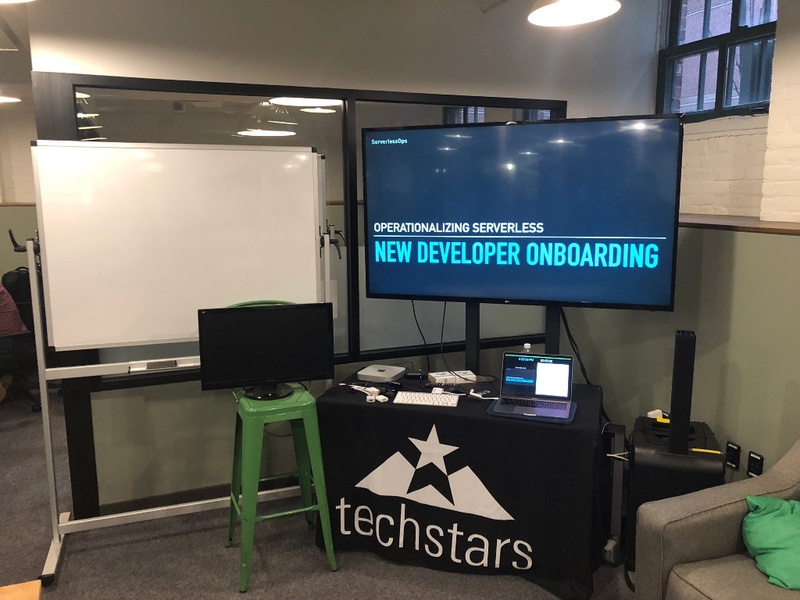 We presented for the CTOs at Techstars Boston. We've chosen to focus on demonstrating what a serverless development workflow would look like within an organization. There's already a good amount of information available on what serverless architecture looks like so we've chosen to cover implementation details an organization will face. What does a team's development workflow look like? How do you segregate different development environments? And what does a CI/CD pipeline look like? ServerlessOps is establishing organizational best practices so teams can continue to focus on delivering core technical value. We'll be expanding our workshop to cover even more topics. If you're an organization interested in beginning your serverless journey, or a product company interested in educating users, shoot us a message at hello@serverlessops.io to discuss partnering. Don't forget that today at 1pm ET / 10am PT we'll be on the Signal Sciences webinar discussing serverless security. (Hence the earlier delivery time this week.) We thought it would be great to bring an operations person and security person together to ask questions of each other's expertise. You've been waiting for this, we've been waiting for this, we've all been waiting to use SQS as an event source for Lambda. It's not available just yet but know that it is coming! Read on for the week in product and platform announcements around the AWS serverless space! The IOpipe platform now captures and displays event information. This is incredibly useful when you're trying to debug or understand how a function works or how a new function should work. This will mean less turning on the debug logging in our code to capture events when we need to remember what we're working with. AWS SAM has now been open sourced. While the specification has been available on Github and open to requests, AWS has now open sourced the implementation. It can be found under the samtranslator/ directory. PureSec has announced their product beta! Signup for a chance at early access. Want to know more about it? They'll have a webinar this week to show off more of their product. AWS unveiled Secrets Manager for securely managing secrets. The most common question we've seen is why use it over AWS Systems Manager Parameter Store? Eric Hammond provided a Twitter thread explaining exactly why. Secrets Manager provides secrets management while Parameter store only provides secrets storage. The ability to quickly and regularly rotate secrets is what Secrets Manager provides over Parameter Store. If your security maturity has you already centrally managing secrets, you now have the ability to perform quick and regular rotation in your environment. Thundra just recently went beta and last week they had a webinar to show off their new product. One of the interesting aspects of their product is the approach they've taken to receiving data. Rather than making then Lambda function do the work they rely on CloudWatch. See their reason why here. Also, we make an appearance in their webinar! For awhile we've seen people in the AWS serverless community asking for an updated NodeJS runtime. Their requests were answered last week. With the latest NodeJS you can use async/await operations to simplify asynchronous operations. See the announcement to understand using that to simplify callbacks.